What is an O-1 Visa? An O-1 Visa is a non immigrant visa granted by the United States to foreign nationals with extraordinary abilities in sciences, arts, education, business, athletics, motion picture and television. If you have an in-depth knowledge and expertise, notable achievements and internationally recognized awards in one of these particular fields, you may be qualified to apply. Still, this type of Visa is very particular and can be very explicit. Being at the top of your field does not automatically gets you an O-1 Visa, you have to prove it and submit the most subjective requirements in order to qualify. 1. It’s valid for 3 years – but can be extended or renewed on a yearly basis. Total length of stay depends on the length of time necessary to accomplish the initial event or activity. 2. It can be extended to immediate family: Spouse and children under the age of 21 can apply for non immigrant visa with the same period of stay as the O-1 visa holder. 3. You can establish and pursue related professional career internationally – Taking a leap and getting out of the comfort of your existing surroundings open a lot of opportunities to grow and boost your career. 4. An O-1 visa may get you a Green Card to be a lawful permanent resident after living several years in the United States and by filing a petition for a US green card through the EB1 – an employment-based immigration visa first preference. 5. O-1 visas processing time can be relatively short – USCIS allows premium processing for the O-1 Visa for an additional fee of $1,225 – this shortens the process in as fast as 15 days or less. 1. First off, you’ll need a job offer to get sponsored. An O-1 visa is only available to be applied with a supporting employer willing to sponsor and file a petition for you. 2. Secondly, you must meet the O-1 visa criteria and demonstrate your extraordinary ability in your specific field. Approval depends on your credentials, skills, achievements, awards, nationally or internationally recognized prizes or recognitions and extraordinary abilities – so make yourself as visible as you can, get into magazines and newspapers, participate on conference panels, join associations with international experts in the field. 3. Get the best immigration lawyer. Filing your own O-1 application can be so complicated and confusing hence seeking a professional advice would be wise. An experienced immigration lawyer goes over every detail of your case and helps you to prepare a compelling petition and strategies to get qualified. Step 2: File petition form I-129, a petition for non-immigrant worker. This should be filed at least 45 days before the date of employment. Only a US employer, a foreign employer, U.S. agent, or association of U.S. agricultural employers may file this form. The petition must be completely filled out and duly signed, and must be accompanied with $460 filing fee – that shall be paid via check and money order payable to U.S. Department of Homeland Security. At the time of filing, you must submit the petition along with all the required evidences and supporting documents. Once USCIS receives your documents, you will receive a receipt notice for the form submitted and receive another written notice of a decision. Should you wish to speed up the processing of your O-1 petition, you may pay an additional fee of US $1,225 to get a prompt decision within 15 days. Otherwise, you will wait at least 2 – 6 months for a decision. If you’re already in the Unites States, you may be able to start working as soon as you receive your approved petition. Otherwise, you must proceed to step 3. Form DS-160 confirmation page – this is electronically generated upon completion of form DS-160 online that should contain your application ID number. Getting your Visa approved shall make you admissible into the United States and therefore be able to start working for your employer as soon as you arrive in the US. Your O1 Visa is valid up to 3 years and can be extended on a yearly basis as long as you continue doing the activity or job for which you were granted O1 visa. Dual intent is permissible for O-1 Visa holders – this means you may lawfully apply for US permanent residency sometime in the future if you wish to. The easiest way to get a green card with an O-1 visa is by filing an EB-1 Petition – another employment based visa which is valid for a period of ten years. Eb-1 and O-1 almost have similar outlined requirements. People eligible for EB-1 are those with extraordinary abilities, those who are outstanding professors and researchers or multinational manager or executive with at least three years of experience. First, you will need file Form I-140 – Immigrant Petition for Alien Worker with USCIS – no need for the employer or agent to file this for you, this can be filed by the petitioner itself. Upon submission of form I-140, you must attach significant evidences with your petition, proving you have sustained national or international acclaim and that the achievements have been recognized in the field of expertise. You must also attach evidences that you intend to be an asset in the country by coming to the United States to continue working in your area of expertise – such as letters from prospective employers and contracts. Along with the form and the supporting documents, you must also include a filing fee of $700 – which can be paid with a money order, personal check, or cashier’s check. Once your petition got approved, you will file a Form I-485 (Adjust to Lawful Permanent Resident Status) with USCIS. After filing it, USCIS shall mail you a notice for your biometrics services appointment at a local Application Support Center (ASC) and may schedule you for an interview. USCIS shall send you a written decision notice whether your application has been approved on denied. If approved, you’ll receive an approval notice and your actual Permanent Resident Card (Green Card). It is strongly recommended to seek advice and assistance from a qualified attorney or legal firm when applying for this type of Visa. 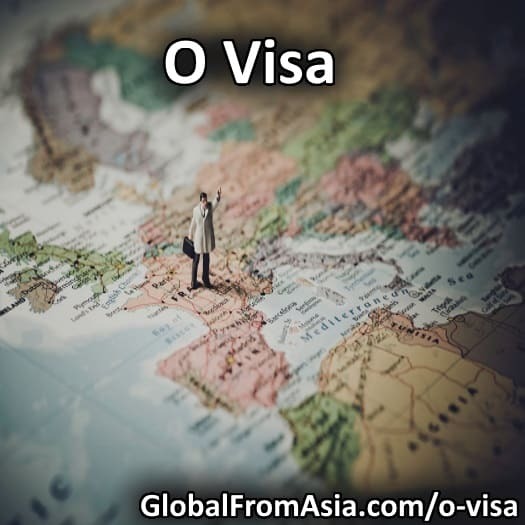 Getting an O type of visa can be a lot of work – especially putting all the requirements together. Very few people qualify for an O-1 Visa. Remember that this type of visa is for those who possess extraordinary abilities – you can’t just be good in your field – you must be exceptional and you must be at the very top of your field. Best of luck!